To expand and upgrade the Benin Airport for efficient service delivery and increase passenger traffic, the Federal Airports Authority of Nigeria (FAAN) and the Nigerian Airspace Management Agency (NAMA) have expressed readiness to partner with the Edo State government to improve the facilities and safety at the airport. The Managing Director of FAAN, Engr. Saleh Dunoma and Managing Director of NAMA, Capt. 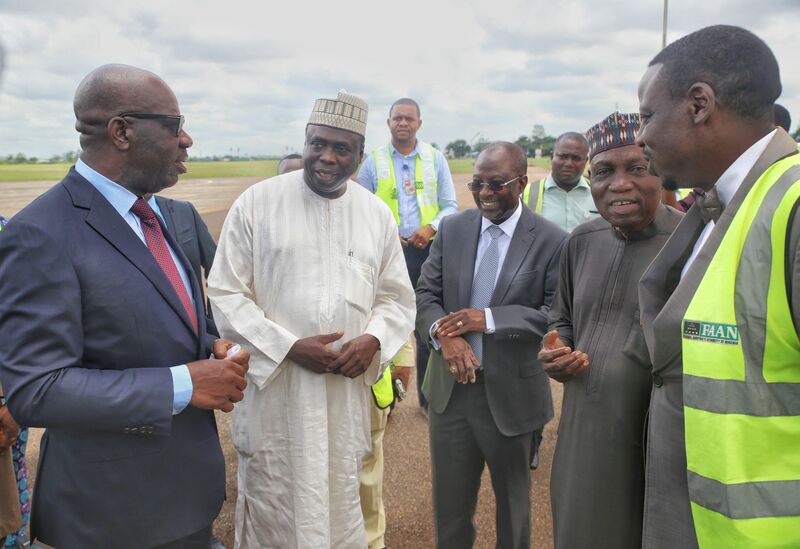 Fola Akinkuotu and the Edo State governor, Mr Godwin Obaseki decided to strengthen partnership to refurbish the airport after the trio inspected facilities at the Benin Airport on Wednesday. Governor Obaseki said his administration would work with FAAN and NAMA to develop a plan before the end of the year to ensure that the Airport space was expanded. He said the state government aims to effectively utilise assets and resources located within the state for the benefit of the people, which necessitated the inspection tour of the Benin Airport. This, he explained, would give government a better understanding of the opportunities for boosting economic activities in the state. “We have approached the Federal Authority to kindly come to our aid regarding the airport. The plan is to first improve the facilities in this airport and ensure that we have the right landing facilities. “This will enable the airport embark on 24 hours operation. With more airplanes coming in, we will see a lot more passenger traffic coming into our state,’’ the governor said. He added that the state has set machinery in motion to ensure that it recovers and returns parts of the airport’s land that have been encroached upon by residents, noting that occupants with genuine Certificate of Occupancy will be compensated. The MD of FAAN, Dunoma, acknowledged that it was the responsibility of the Federal Government to improve facilities at the Benin Airport, and said that assistance from the Edo State government was a welcome idea. He said that ‘’I want to thank the governor for coming to our aid and with his assistance we can do a lot more. We have inspected the facilities here and we will submit a report on what we need to do to improve the safety and facilities at this Airport,’’ he said. Capt. Akinkuotu of NAMA said joint effort was needed to ensure safety is maintained at the airport, adding that the agency would collaborate with the Edo State government to ensure passengers do not only feel safe, but have good reasons to fly to the Benin Airport.